I stumbled upon Align Your Story in a moment of sheer desperation. I had been writing poetry for years, been published just once, and working on a book that needed a lot of help. I had taken online courses before and found them to be too fractured, time-consuming and a bit impersonal. From day one, Align Your Story is a thoughtful, engaging and inspiring series of modules that takes the writer on a deeply spiritual, soul-filling journey that has the potential to shift your life dramatically. The yoga and meditation exercises were an unexpected bonus and gave consciousness and clarity to each of the writing practices. I had never before written with so much freedom and personal insight as I was compelled to during Nadia’s course. Her genuine interest in bringing out your authentic voice, and gently teasing out the parts of your personal journey that lend weight and meaning to your work keeps you coming back for more each week. The community of sojourner/writers who participated along with me in the course have become both trusted sounding blocks and friends. I look at this course as my own personal spiritual spring cleaning…the fact that I can access the course anytime I want offers endless opportunities to regularly clear out the “dust” that collects in the crawl spaces of my soul. 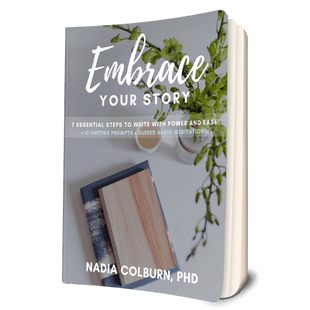 Nadia Colburn has developed a generous and comprehensive approach to guiding both the amateur and the experienced writer. No matter what kind of writing you want to do, this course is a must! I don’t think it’s an exaggeration to say that taking my first workshop with Nadia was a life- changing event. I had been struggling to get back into my writing, and stuck in some old challenging patterns that I couldn’t break out of. The yoga and writing workshop was the first way of breaking that pattern, and then Align Your Story was like going from making a drawing with colored pencils to oil painting. Align Your Story was a much richer and more fulfilling experience, simply because there’s so many more resources and much more time. But taking the course didn’t just help me come back to my writing; it also restored a faith or belief that I hadn’t realized I’d lost—and that’s the belief in the possibility of transformation. I had had a lot of hard experiences in a really short period of time in my life. And I hadn’t recognized how those experiences had hardened me and even made me cynical about my own future. I felt like I was stuck and just spinning my wheels. I know that working with Nadia through Align Your Story has been instrumental in moving beyond that phase in my life. I was on the fence about taking the course because it was a bit of a financial leap for me. Nadia was incredibly patient and generous with her time in helping me make up my mind. I am still amazed and so grateful that she was able to see intuitively what I was struggling with and accept me where I was. It didn’t take much explaining or story- telling on my part for her to understand the hurdles that stood in my way, which I kept brushing up against, and to help me step over those in a way that felt comfortable. Not once did I feel like I was being pushed into anything. I’m so happy to have been invited to the course and to have participated in that community, and to have it be there for me whenever I need. I can’t say enough good things about it. Perhaps the most important one is this:I know that I wouldn’t have been able to come back to myself fully as a writer had it not been for this course or to come back to my faith in my own abilities. The readings and lessons, and the yoga and meditations all go so well together that I wonder why they would ever be separate. And I know that I’m going to continue to grow as a writer and, to use a phrase from the course that I love, a spiritual being by returning to Align Your Story. I went into Align Your Story unsure about doing another group focused class but the possibility of finding my way through some tough decisions about my writing life made the promise of a mindful experience with AYS and Nadia appealing. I was unprepared for what happened during my first reading in the group. I felt this familiar welling up inside that I knew would lead to the one thing I tried to avoid at all cost – crying in front of others. I couldn’t get my words out because my voice was trembling so uncontrollably. I had a choice – quit and hide, as I normally would do or allow what was happening to happen. I chose to give my voice an opportunity for healing. The encouragement and level of acceptance I felt from Nadia and the group allowed me to move past the embarrassment and deal with this unresolved trauma around being seen and heard. My authentic voice had been buried under all of this fear and was ready to come alive and Align Your Story was an opportunity to come out of hiding. The course gifted me the opportunity to heal what was in the way of my own inner sense of knowing my own emotional voice. Nadia and our group showed me the value of group support and how to follow what really needs my attention without needing to force a direction. The course taught me to mindfully step back and be still and just allow what needs to happen to happen, and this is a lesson I will forever cherish and take with me throughout my life. Nadia’s high level of emotional and spiritual maturity has prepared her to provide that light and supportive wisdom we most need to interrupt our fears of becoming. I am truly grateful for Nadia and the AYS group! From our first meeting I knew I could trust you. You instantly created a safe space and I felt comfortable sharing and just being myself. Through your coaching you helped me focus on the things that really mattered to me; those areas of my life that are most deserving of my time and energy. As a single mom running a business I sometimes try to trick myself into thinking I can do at all. You really helped me to see that sometimes slowing down is actually doing more! I began to be able to think clearly in a way that helped me organize my thoughts and goals. You have a desirable mix of intuition and practical wisdom which helped me to get in touch with those very parts of myself. I feel so grateful for our time together and the gifts that you have given me through your skillful coaching. As much as the word is overused, Nadia Colburn is an unusually gifted presence and teacher, helping many transform their practice and their willingness to trust themselves enough to get to the heart of what they are trying to say. Nadia is that rare teacher whose very presence in a room creates an atmosphere of trust and honesty, even among people who have never met before. An accomplished writer herself, Nadia brings a rare balance to her teaching: deep reflection and critical thinking about language, ideas, images, and meaning; and a compassionate, open heart that allows everyone to feel safe sharing and offering personal responses to one another. Having worked with Nadia Colburn for approximately ten years, I continue to seek her assistance. Both her innate sensitivity and her scholarship allow her to give outstanding guidance to writers. Her approach is intuitive and intelligent. Her suggestions are insightful and sharp, and at the same time she is always open to others’ ideas for structure and content. Nadia’s steadfast encouragement helps to bring even the most stubborn piece of writing into focus. author of Far From Home. Being able to take the class as a complete beginner. The amazing people I met, starting with Nadia. The intimacy, the safe environment. The division of class time between the studied literature and our work. Coming back session after session. Taking Nadia’s class changed my life and I do not exaggerate when I say it was how I found my true life, my true self. Yes! I would highly recommend Nadia and her classes. When I first learned about Align Your Story, the line “when we come more into synch with ourselves, our voice becomes freed” reverberated in me. I have a physiological problem with my voice: I have one functional vocal chord and one paralyzed vocal chord. There are moments in my life when energy flows freely through me, and in those moments I am able to speak without strain or pain. These moments are rare. Most of the time I have great difficulty moving my voice from my belly up to my vocal chords and through my mouth. I thought your course might help. I’m so grateful for the course. I’ve been working my way through it at my own pace ad have experienced a freeing up of a lot of the tangled-up-ness that strangles the energy that wants to move through me, that wants to be spoken. My voice is getting stronger. I’m finding ways to connect it to my body differently. I feel like this course is an amazing countainer that holds me and protects me so I can do the things I need to do. It’s like a womb and I’m coming back to life. In the time of this course alone, I’ve started two new projects, two blogs that I wanted to create for a long time. I’ve tried many forms of healing, and have been so stuck for a long time, but things in me are moving now, and I’m learning really to listen to myself and to my body’s messages and to express them in new ways. I’m immensely grateful for Align Your Story and Nadia’s spiritual guidance.. Working with Nadia I have seen myself grow from a novice writer with a tentative voice to an experienced writer who has found her voice and embraced it! I had been searching for several years for a teacher who could help me take my writing to a new level of expression while preserving the integrity of my own voice. When I met Nadia, I knew I had found my teacher. Nadia helps writers find the authentic in their own work and in the work of writers they read together. Her workshops are thoughtful, well organized – and inspiring. Over the decade I have worked with Nadia, I have created a coherent and strong body of work. Nadia is a smart, skilled, insightful, and kind teacher. Who could ask for anything more? Align Your Story was the first online course I’ve ever taken, and I am so glad I took that leap. Nadia is an amazing facilitator – so warm, welcoming, and inquisitive. Her generous style lends itself well to learning and inner growth. I felt completely held by the group, even though I never met anyone in person! I am deeply grateful for having had this opportunity to combine my interests in writing, meditation, and yoga. I now have a new way to approach all three. I signed up for Nadia Colburn’s poetry seminar with great trepidation. I was afraid that the act of facing a blank white page day after day would be scary; it had been so very long since I had put my longings, my failures and my observations on the page for other readers. But, I had this yearning to come out of hiding. A yearning to be known in the way that one is known in poems. So, I did sign up for Nadia’s class. I found Nadia’s reserve and deep knowledge about the history of verse and poets to be calming. Nadia shared with us poems that used metaphor to both reveal and to hide those deep (scary) emotions. Her close attention and respect for us as human beings and for the writing process allowed me to both reveal and to keep hidden those terrifying feelings. Nadia created an atmosphere of respect in her class, and I loved both reading and commenting on the poems our classmates had written. This is SACRED work when it is done in the right space; Nadia created that space. I credit Nadia for giving me the courage to write about and through my pain and fear. I studied with Nadia for a number of years. It was through this work that I came to a new career—making documentary movies. Good writing teachers encourage true expression; that expression acknowledges pain and also leads to real self empowerment. Nadia Colburn is truly one of those very great teachers. Her profoundly powerful lessons, readings, supporting yoga movements, meditations, and guidance in the weekly phone conversations, met me exactly where I was on my own path. Her insight and candor reached directly to parts of my own unconscious. signed up for Align Your Story Premium Plan after reading one of Nadia’s essays in Spirituality & Health magazine. I was excited to write about my life from a more holistic place. I’m so glad I signed up. The course helped me more fully integrate some early difficult life experiences. Although I’d been journalling about these experiences and had even dealt with them in therapy, it wasn’t until I addressed them through AYS that I really saw a positive shift in the way I approached my life story. Working one-on-one with Nadia helped me work through all the resistance that came up in writing and also guided me to create a finished, polished piece that I went on to publish. Writing and revising that final piece into a cohesive story allowed me to see my life through a new lens: from a wider, more vibrant, more multidimensional angle. I’ve taken several writing courses and completed a number of short and long-term writing challenges over the last year, as I built a new foundation for my writing practice. I was looking for a fresh approach, one that reaches beyond technical tools and the simple (though not terribly accurate) notion, write more to write well. Nadia’s course Align Your Story was ideal. Nadia is a skilled, generous and accomplished teacher. And she is also a trained, experienced writer and wonderful reader. Her course is constructed on her love of poetry, prose, and short stories. There is so much in her beautiful analyses to inspire her students. I loved the weekly readings and the acuity she brought to our discussions. And Nadia doesn’t leave the course on the page, her approach is three dimensional. The powerful intellectual architecture of the course reaches beyond our tendency to force, coerce, plead, or bargain our writing into existence. Nadia integrates meditation and breathing techniques, uses chanting and yoga sequences to give our brains a rest, teaches us to access insight and creativity from our bodies, and balances thinking with the means to relax and rest into the writing process. It’s wonderful what shows up in your writing as a result. Align Your Story crisscrosses new energy, stamina and joy in the writing process with the stalwarts diligence and discipline, an alchemical energy that gave me the confidence to start writing fiction and tempt my love for poetry. I’ve recommended AYS to colleagues and friends keenly interested in expanding the artistry and dexterity they bring to their writing. And I’m so grateful for lifetime membership, as I will surely jump in with other members of her terrific community during the next session. At the time I registered for “Align Your Story” I was in my second year of retirement from corporate America and struggling to recover the creativity I’d had as a child. In particular, I was drawn to writing poetry and creative non-fiction, which I was doing in fits and starts with little to show for it. I questioned whether I even had anything of value to write about. When I discovered Align Your Story it was an affirmation to myself that I deserved to take my interest in writing seriously, and I’m so glad I made that decision. “Align Your Story” immediately gave me the structure and support I needed to practice writing, including a weekly one-hour live conference call led by Nadia and the community of the facebook group. When I registered for the course, I was afraid that anything I wrote might be criticized and nit picked. My experience was just the opposite. Nadia was supportive and gentle with everyone, helping us see our strengths, providing feedback that further fanned our creative sparks. We followed her lead and treated each other’s efforts with the same respect. Align Your Story showed me I do have a story to tell. Thanks to Align Your Story and Nadia’s support, I continue to write, determined to own my power and let my voice be heard. Align Your Story has made me a more confident, much happier writer. After years and years of writing day to day journal entries – a never-ending, unedited collection of scenes from my life – I have learned to take that raw material and shape it into pieces of a memoir intended to have meaning for readers. Align Your Story gave me the audience I lacked. I have learned to transform my solitary thoughts into accessible prose, thinking of Nadia and my classmates as my readers. Each of the modules in the class gave me new opportunities to practice the art of writing, to see through the eyes of other writers, and to find stillness in the midst of life so that I could focus on writing. I eagerly awaited the arrival of each module, and was sorry when they ended. I love working with words, and do so with even more pleasure and much more confidence since the class. I am grateful. I was a student in Nadia’s Align Your Story this past summer. Align Your Story deepened my connection to my writing and supported me in establishing practices in meditation, yoga, and journaling, which I’ve wanted to do for years. Having the material available in text, audio, and video form, with lessons, close readings, suggested readings, writing assignments, as well as meditation and yoga, gave me lots of ways to access the course, which I sometimes did while making dinner, other times when I found free time in my day. I was also a participant in several of the conference calls, which were wonderful, and had a productive and enlightening in person coaching session with Nadia to finish off the experience. Since taking Align Your Story, my writing, my sense of self, and my ability to find my center have all shifted to a place of greater clarity. Thank you, Nadia! Nadia, Align Your Story is unlike anything I’ve ever participated in. You take a holistic approach to writing, and in this holistic approach every aspect of my being was attended to. When I met you at a meditation retreat I immediately sensed in you a generosity and kindness that touched me deeply. Standing next to you I sensed an angelic presence that was soothing and healing. It was my experience that your course is infused with this healing energy. I had participated in writing courses in the past, though none as healing as this one. Your patience and your reverence for my inner guidance allowed for a deep resting within, and from that place of resting the frozenness began to thaw and my writing flow returned. Much gratitude for holding me with such reverence and grace in my time of need. Nadia’s dedication is amazing, she always encouraged us to develop an own personal voice, without any judgement. She accompanied us through this sometimes hard but always rewarding path. Diving into yourself is always a challenging task; however, Nadia was there to help you and to spread an invisible net to hold you. She leads us through roads that were unknown for me. The combination of readings, writing exercises, yoga practices and meditation made me unfold layer by layer until I found me, my real me, myself. Moreover, she gave us the opportunity to join an unforgettable journey that has brought me bliss and peace. I now know that I can not only be creative but also a conscious citizen with a lot of to offer to the world. I feel deeply grateful to Nadia Colburn for all the thought, care, expertise, and heart she has put into developing Align Your Story, which is evident in every detail of the course content, and which shines through her extremely warm, welcoming, and responsive facilitation and communication, as well. I feel empowered by participating in this course, as it has encouraged me to write with more courage, vulnerability, freedom, and authenticity and to appreciate the ways in which my yoga and meditation practices nourish my writing and creativity, and vice versa, linking mindful expression and reflection in an integrated process. I found my way into the course during a time of navigating several transitions and personal challenges this winter, including the loss of a loved one, the grief that followed, and new beginnings in my life, as well. In the midst of all this, I found that the tools Nadia offered were a helpful way to process what I was experiencing, offering both a chance to look inward as well as to join together with a community of other women, who inspired me through the writing they shared and the recognition that, although we were only connected by email and phone, we were accompanying one another on transformational journeys. I am excited that this program will be available to more women and hope that all who participate will find it as healing, stimulating, and liberating as I did. Thank you, Nadia! Nadia is amazing! She really lives what she teaches. She looks very deeply at life and then lives it very authentically. She inspires everyone around her to do the same. Just being in her presence is a gift you give yourself! So don’t hesitate, work with Nadia. It will transform your life!